While both of these technologies will keep you anonymous by hiding your IP address, they work in slightly different ways. A proxy acts as a gateway to the software you use it in, for example your ISP is your gateway to the internet, same idea for the proxy to your software, proxys (apart from SSH proxys) are not encrypted but traffic wont reach your network to begin with. An anonymous VPN will protect your entire internet connection the moment you connect to it, disguising your use of everything from utorrent to email to basic web browsing by establishing a virtual network via our servers to reroute all your traffic and DNS. Think of a proxy server as a gateway. You have control over proxy settings, which only affect your torrent client (utorrent, bittorrent, vuze, ect) or any other program that supports socks5 proxies. A proxy only provides IP masking to one application at a time. When you download and seed torrents or browse the web, all your traffic is routed through the anonymous proxy server and directly to you. This means that peers in the torrent swarm will not see your IP address, but rather the IP address of TorGuard's proxy server. When using a torrent proxy, you get all the benefits of torrenting and the proxy server, including security, speed, geographic location, and an anonymous IP. Unlike a proxy, which only secures your torrent client or web browser, VPN (Virtual Private Network) encrypted tunneling secures 100% of all your internet access, replacing your local ISP routing for all applications. 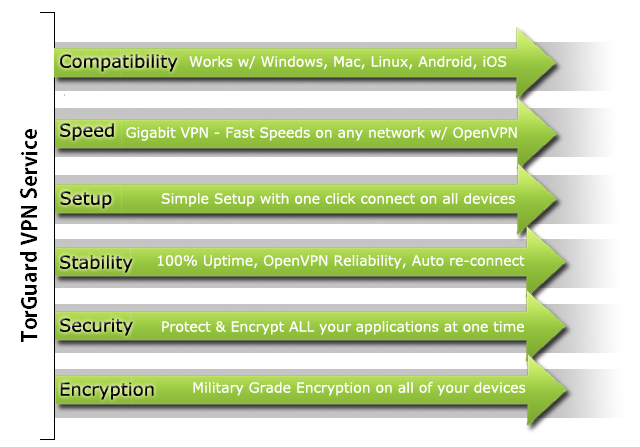 With a fully anonymous VPN server, you will enjoy enhanced security regardless of geographic location. This protects not only your torrent downloads but also all other online activity or programs such as your web browser, email, and any other third party applications that connect to the web. You'll also get faster connections and military grade encryption when using a VPN like TorGuard. And, your VPN can easily be connected or disconnected with just one mouse click.